I haven’t posted anything in several weeks. My excuse has been the never-ending kitchen remodel. I’m able to use the kitchen, but still waiting for a window to be built and the painting to be finished. Then, I’ll be able to finish moving back in and clear out what’s stacked around the house. Whinging aside, I found a new recipe for a White Salad that is so good I couldn’t wait to share it. Originally called Parsnip and Endive Salad, I have renamed it White Salad, because all the ingredients are pretty much white. The exceptions are bleu cheese and chopped pistachios. If you use a mandoline, the salad prep comes together quickly. While roasting the parsnips, you have plenty of time to make the dressing and to prep other dishes for your meal. I served this salad along side roasted green beans and mushroom caps with their roasting liquor intact and a simple grilled steak. The salad was the star of this meal, so it got the photo! The salad is bitter, tart, tad salty all balanced with sweetness from the parsnips and dressing. It is a delightful medley of taste sensations. 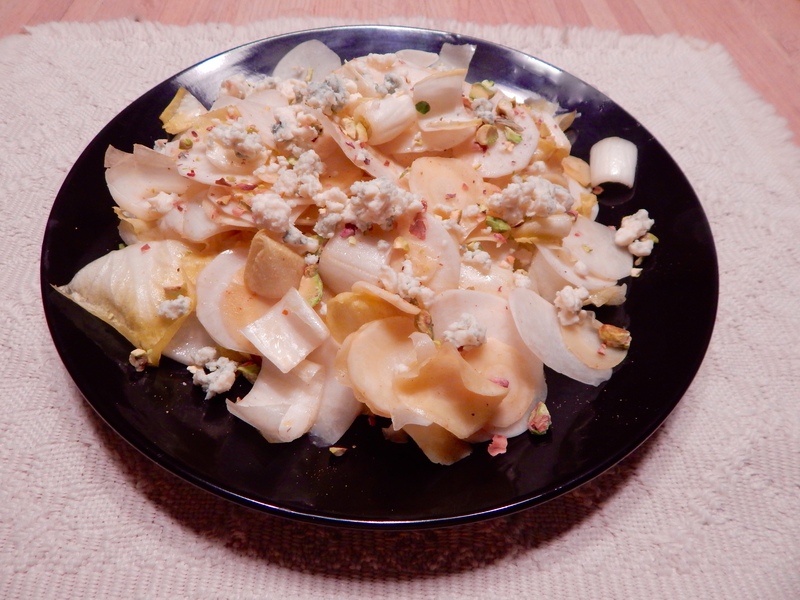 The natural bitterness of the endive and tart raw turnips are balanced by sweet roasted parsnips and a tad of sugar in the dressing. Preheat oven to 400. Toss parsnips with agave and 1/4 cup oil on a rimmed baking sheet; season with Kosher salt and half of chili powder. Roast, turning once, until parsnips are tender when pierced with a paring knife, but haven’t taken on any color, about 10 minutes, depending on thickness of slices. Meanwhile, whisk lemon juice, sugar, remaining chili powder and remaining 1/4 cup oil in a small bowl until sugar dissolves’ season dressing with Kosher salt. Toss parsnips, endive leaves, turnips and among plates. Drizzle with dressing (save any extra for another salad) top with blue cheese and pistachios and season with finishing salt.